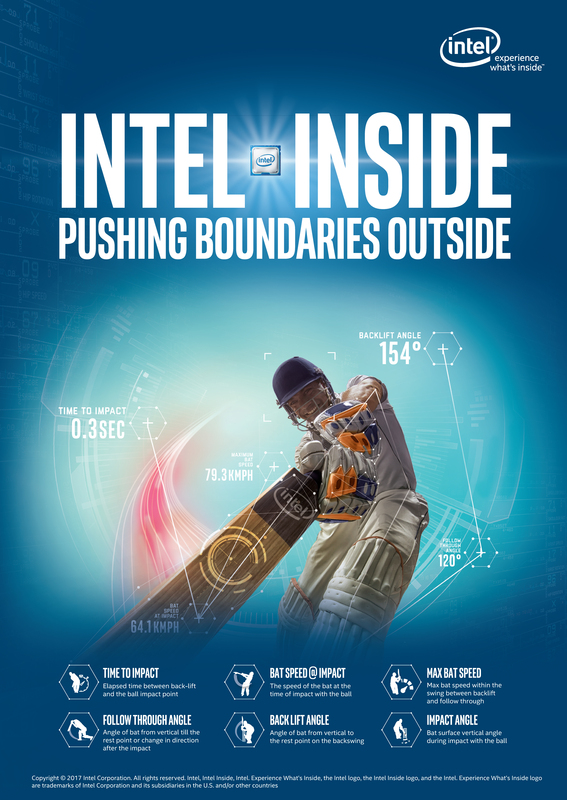 Today at the International Cricket Council (ICC) Champions Trophy, Intel executives took the stage to share new innovations Intel is bringing to the tournament. 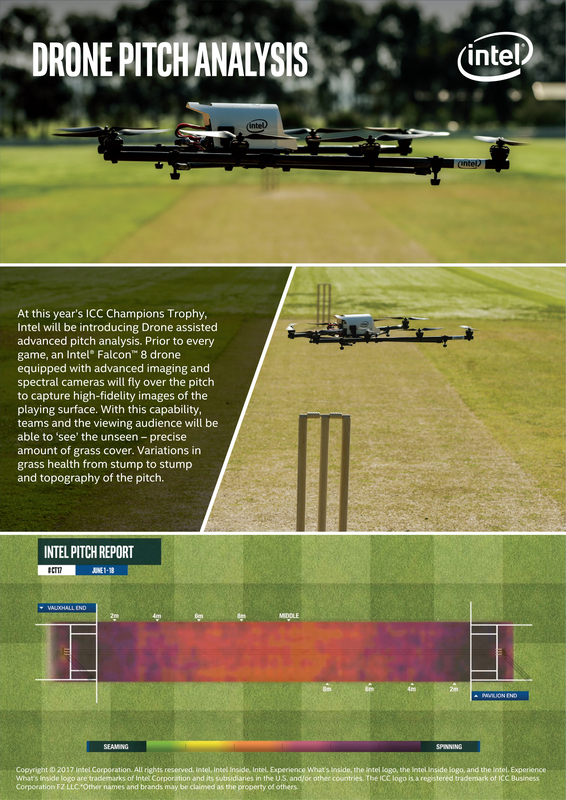 These include advanced pitch analysis by an Intel drone, a bat swing profile using a bat sensor powered by an Intel® Curie™ module and a cricket VR experience for the fans at the stadiums. Intel Sports Group Vice President Sandra Lopez highlighted the role of technology in transforming the way we play and view sports. With higher levels of digitization, Intel is in a unique position to enable the sports industry to capture and analyze data to uncover and respond to new insights in real time. “Our goal is to lead the way forward into the digitization and personalization of sports, transforming the way fans and athletes experience sports,” Lopez said. Later, Anuj Dua, director of marketing for Intel’s New Technology Group, detailed the innovations Intel is bringing to the current edition of Champions Trophy. In a first at the Champions Trophy, the Intel® Falcon™ 8 Drone, equipped with high-definition and infrared cameras will be used for advanced pitch analysis before every match. Images captured by the drone will offer rich visual data on pitch conditions such as grass cover, grass health and topology, which will be used to generate daily pitch reports leveraged by commentators during broadcasts. During his presentation, Dua introduced a new bat sensor powered by Intel Curie technology that can be mounted on any cricket bat to generate data for every stroke that the batsman plays. With this technology, parameters like back-lift, bat speed and follow-through can be tracked for every cricket stroke. Several batsmen will use these bat sensors in the games at the 2017 Champions Trophy, enabling new insights on stroke play and rich storytelling during broadcasts. Speculur also announced plans to bring this technology to consumers later in the year. With Speculur BatSense, hundreds of thousands of young and aspiring cricketers will soon be able to measure, track and improve their batting skills. Speculur plans to make Speculur BatSense with Intel Inside available in Australia, India, the United States and the U.K. in the second half of 2017. Former English captain-turned-commentator Nasser Hussain, who joined Dua on stage, stressed that technology has and will continue to positively affect cricket in a lot of ways. Player performance, game strategy, adjudication and fan experiences will all change with the introduction of new technologies to the sport. Intel is also showcasing innovative experiences for in-stadium fans. Virtual reality (VR) experience zones at The Oval and Edgbaston will allow fans to experience facing a virtual bowler in an immersive cricketing environment. Using a head mounted display (HMD), the player will be able to test his or her batting skills against a virtual bowler. Using the Intel Curie technology-enabled cricket bat, the player will be able to see data from a swing, such as bat speed and back-lift angle, as well as a simulated score from the VR session.